The M113 is the most widely used and versatile armoured vehicle in the world. Fielded in 1960 as a simple 'battlefield taxi', over 80,000 M113s would see service with 50 nations around the world and 55 years later, many thousands are still in use. 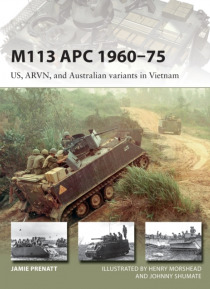 In addition to its original role of transporting troops across the battlefield, specialized versions perform a multitude of other functions including co… mmand and control, fire support, anti-tank and anti-aircraft defence, and casualty evacuation.This new fully illustrated study examines the service record of the M113 from its initial fielding through to the end of the Vietnam War. It will also describe the many US, South Vietnamese, and Australian variants of the M113 used in the Vietnam War as well as information on tactics, unit tables of organization and equipment, and a selection of engagements in which the M113 played a decisive role.